Some truths need repetition. For example: if you raise taxes, people will move to other states with lower taxes. As plain, simple and obvious as this truth is, some people still believe that it is a good idea to raise taxes here in Wyoming. A costly government causes people to leave. 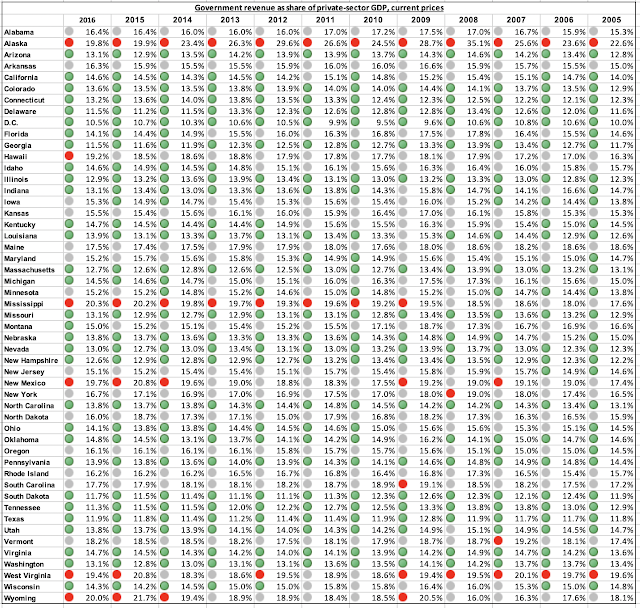 After we review the data in Figure 1, we will take a look at some specifics for Wyoming. A teaser: our government is one of the costliest in the country. --Interstate migration is measured as a ratio between outbound and inbound migration. A number of 100 means the two cancel each other out; when a state scores more than 100, it has a net interstate migration inflow; when the score is below 100, the net flow is negative and the state loses more people than it gains. --The cost of government is measured as total state and local government revenue from "own sources", in other words taxes and fees levied on the state's own residents. This excludes federal funds. State and local government revenue - which again includes fees and charges in addition to taxes - is then divided by private-sector GDP. This allows us to see the true cost of government as it burdens the production value of private businesses, which is the most comprehensive tax measure in the economy. There is a clear trend in Figure 1: in order to secure net immigration, a state needs to keep the cost of its government below 15 percent of private-sector GDP, i.e., production value. 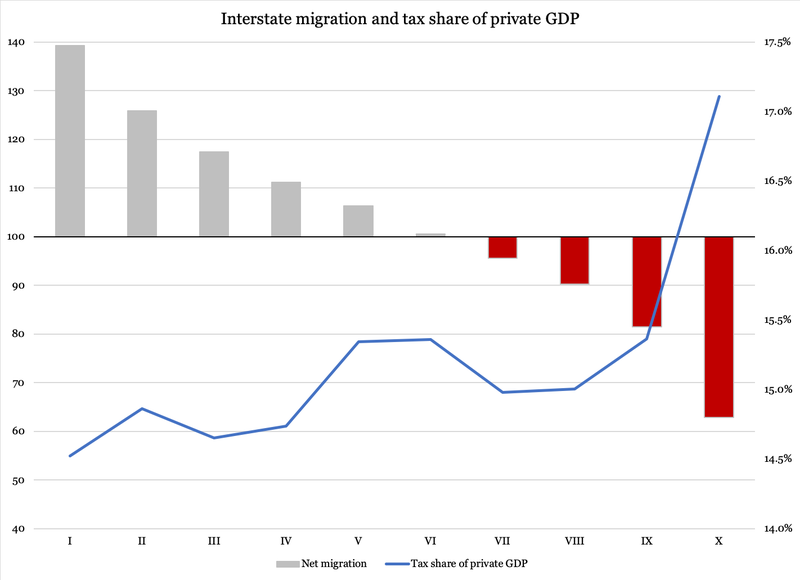 We also see that outliers that raise their taxes high above 15 percent (deciles IX and X) will also see a consistent net migration loss to other states. The color coding differentiates states into three groups: green for states with less than 15 percent government cost; grey for 15-19 percent; and red for a cost in excess of 19 percent. Wyoming is one of only five states with four or more "red" years, and one of 14 states with not a single "green" year. Obviously, this score can be criticized for randomly chosen categories, and anyone is free to put the categories at whatever numbers they want. What we cannot disregard is the fact that in 2016, Wyoming has the second costliest government of all states. 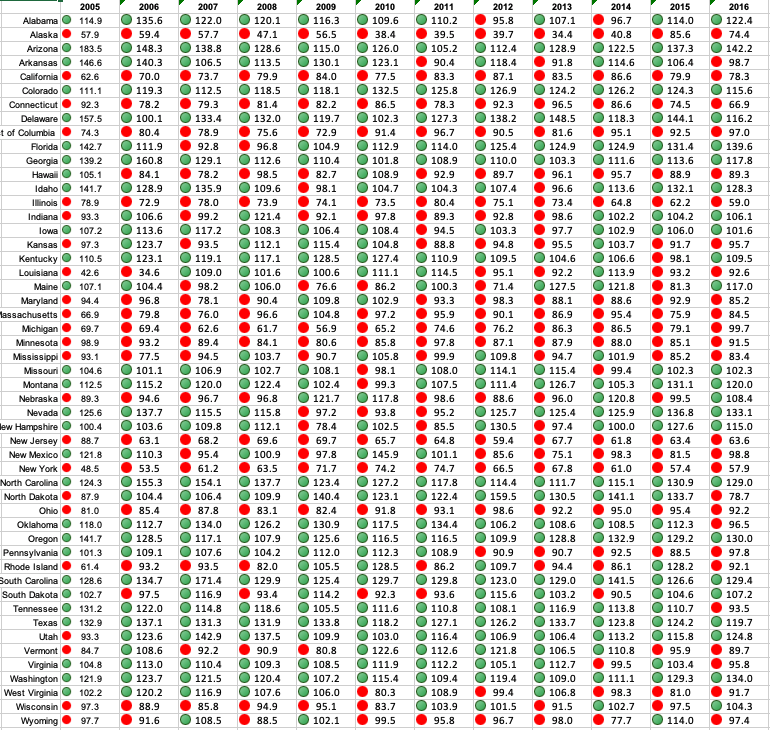 Only Mississippi takes in a larger share of private-sector production value than Wyoming does. In 2015, we had the highest government cost of all states. 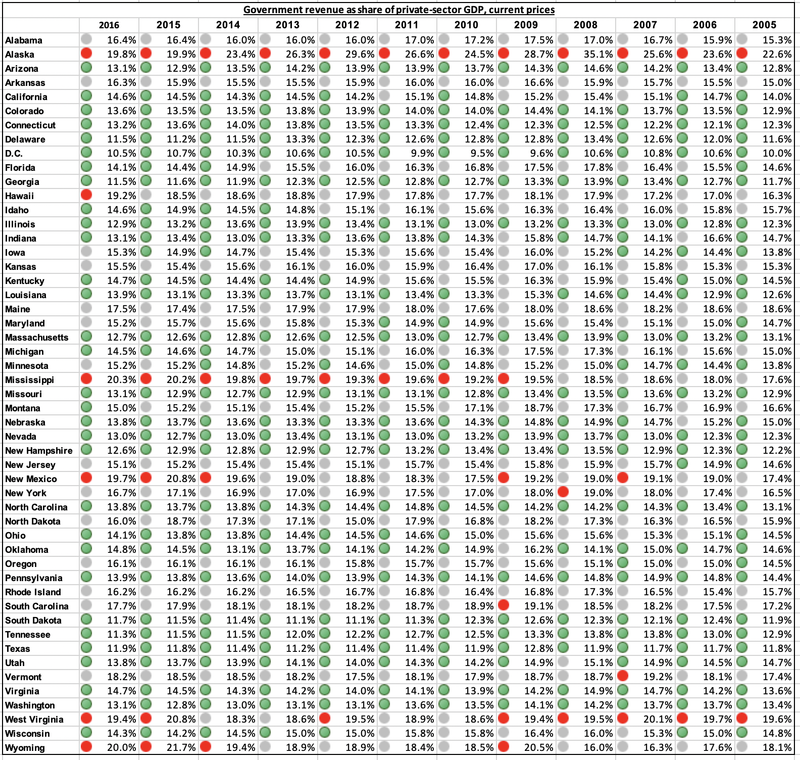 In fact, we have been in the top five since 2009, but our government was not exactly cheap before that either. The fact that our state's population has increased for the most part of this period is due to a relatively high birth rate, and to the fact that in some instances, outbound migration has been only marginally higher than inbound migration. Nevertheless, the negative trend persists, and it might be worth adding that the people leaving our state make less than those moving in. It has been about two years since I reported data on income and interstate migration; as soon as time permits, I will update those numbers. Plain, simple and brutally obvious. *) There is, of course, the more disturbing possibility: they don't really care. I am reluctant to draw this conclusion, but I also want to point to the ENDOW report, which talks about attracting more immigrants to Wyoming. The purpose appears to be to replace those who leave the state, and to do so in a way that won't upset the local culture. I will leave it to anyone so inclined to interpret what this really means; I, for one, do not see the point in maxing out the cost of government, drive Wyomingites to leave and then somehow encourage others to move in and replace those who left. It is a monumental waste of money and human resources. Would it not be better to cut the cost of government so people can afford to live where they want? 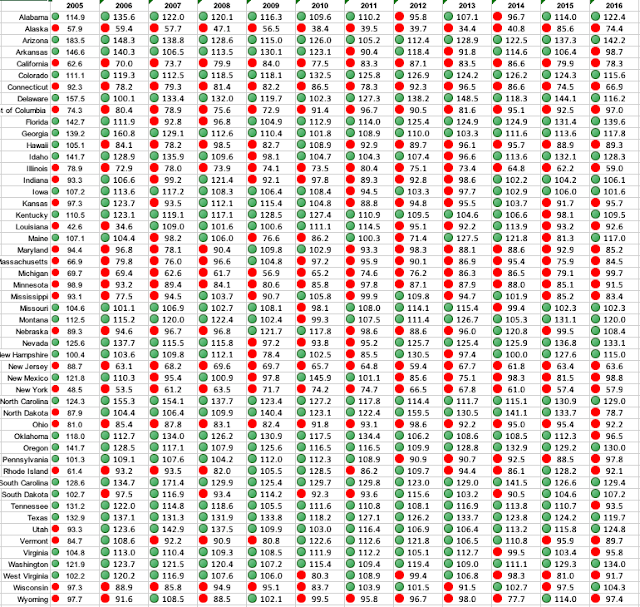 Hmmm this seems to disprove all those who claim we have the lowest tax burden of any of the states. Is this a peer reviewed study? I just read all the facts and wow! You, whomever "I" is has made a statistical jump of genius to relate to completely irrelevant facts together and try to prove a point. You said had Wyoming had a higher tax rate and then people moved. No mention was made of the economy in this time period, or even other significant events in this time frame. I would be ashamed to publish something like this. People are posting this like gospel and I have no idea how to even stop gossip like this from happening. Please stop. Troy Allee, First of all, if you want to know who I am, click the "About us" button at the top of the blog. It's not hard. Second, you are asking for more research - read my other blog articles and you will find it - yet you yourself resort to generalized statements without any facts or even references. It seems like you are mostly angry about facts that contradict your preconceived notions about what our state's economy really looks like. If you are uncomfortable with facts and analysis, there is nothing more I can do for you. If, on the other hand, you have genuine questions of substance, you are of course welcome back to present them. I'm waiting.